At EvidenceCare, we strive to improve the healthcare experience for everyone. Antibiotic stewardship is one of the main areas our tool helps clinicians and hospitals. In this third installment of our series on antibiotic stewardship, we’re looking at what exactly the costs are of overprescribing and reasons providers continue to overprescribe. The overprescription of antibiotics comes not only at a physical price to patients, but also at a monetary price to the healthcare system. Some estimates believe that antibiotic-resistant superbugs created by overprescribing will not only kill more people than cancer by 2050 but could also be costing healthcare as much as $2 billion per year. 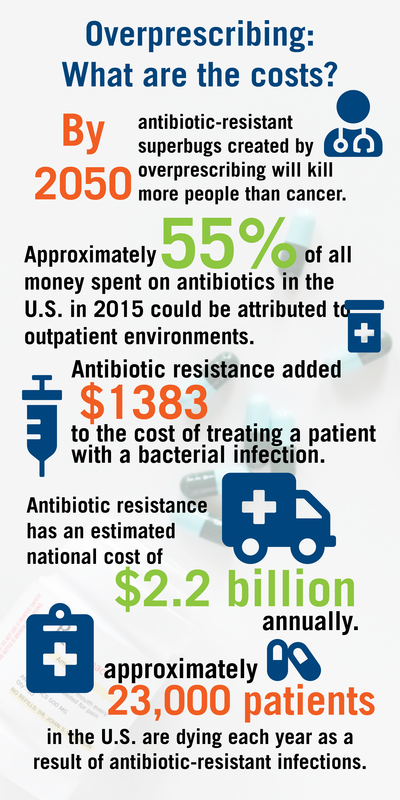 With much of the inappropriate prescribing happening in outpatient settings, a study from the Infectious Diseases Society of America stated that approximately 55 percent of all money spent on antibiotics in the US in 2015 could be attributed to outpatient environments. 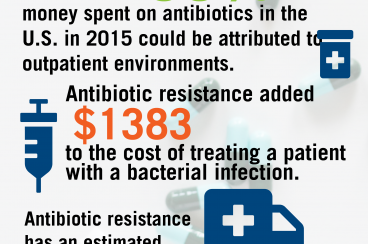 A study published in Health Affairs in March of this year was able to calculate that “antibiotic resistance added $1,383 to the cost of treating a patient with a bacterial infection.” Using that number and the number of bacterial infections in 2014, the study estimated that antibiotic resistance has a national cost of $2.2 billion annually. Regardless of why this may be happening, the troubling statistic is that, according to the CDC, approximately 23,000 patients in the U.S. are dying each year as a result of antibiotic-resistant infections caused by overprescribing. However, we’d also like to start with making antibiotic stewardship an easy practice for clinicians across all care settings. That’s why we worked with leading expert Dr. Frank LoVecchio of the Banner Regional Poison Control Center and Maricopa Medical Center to develop our Antibiotic Advisor. Each of our antibiotic protocols was authored by LoVecchio and contains only the most current, applicable information. Our Advisor is also embedded directly into our other protocols to provide you with medication information right when you’re making the decision. This keeps the choices clear and helps you make the best decision as quickly as possible, saving you time and helping reduce decision-fatigue. Our evidence is also available to add your patient’s care summary to help you explain your care decision to the patient or their parents. If you’re interested in how EvidenceCare’s built-in Antibiotic Advisor can help you in your antibiotic stewardship efforts, sign up for free here.